Promocode For Train Ticket Booking IRCTC– Hello all, Welcome back in Your Website Tricks Store. Today i am back with the offer regarding train ticket booking and cashback on your train ticket amount. Who don’t want to save it’s money and this time i am with you to save your money and back into your account. There is no need to any specific knowledge regarding tips to save money in your daily deals and shopping, you have to just visit tricksstore in daily basis here you will find all the rellated stuff for, which will defiantly give you some benefit. 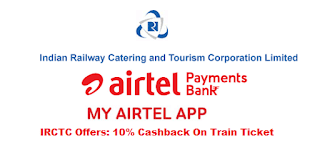 Indian railways official website IRCTC brings you to save your money in railway train ticket booking with payment through Airtel money. Now you have a chance to Avail 10% cashback on IRCTC booking with Airtel money. This Offer can be availed till 31st August 2017. But you have to grab this offer fast because this Offer is only applicable for first 50 thousand users paying through My Airtel Money App on IRCTC website and app. So if you are planning any trip or going somewhere just book your tickets from IRCTC the avail this offer now. Note: Offer is only basis on first come first serve because it is applicable for first 50 thousand users paying through Airtel Money & Airtel Payments Bank customers only. 4. Now fill the name and additional informations like age, gender, seats etc. 6. On Payment page select payment method as Airtel Money. 8. Your cashback would be credited within 48 business hours in Airtel Payments Bank account. *Download My Airtel App or Airtel payments bank. *Make the payment through My Airtel app. *It’s done your train ticket is booked. *The cashback will be credited to the My Airtel app wallet or Airtel payments bank account. 1. The Offer is valid for the My Airtel app users & Airtel Payments bank customers. 2. Only first 50, 000 users can avail this offer. 3. My Airtel app users have to book the train tickets before 31st August 2017. 4. The Customers have to choose the payment option to Airtel payments bank or My Airtel app during the transaction time on IRCTC. 5. Maximum cashback amount on one ticket is Rs 50. 6. The Offer is valid one time per user. 7. 10% Cashback will be refunded to your My Airtel app wallet or Airtel payments bank account. 1. Cashback would be credited within 48 business hours in the user’s Airtel Payments Bank account. 2. In case of ticket cancellation, cashback amount will be deducted from user’s Airtel Payments Bank account. 3. Airtel Payments Bank reserves the right to disqualify any Airtel Payments Bank user(s) from the benefits of this offer in case of any fraudulent activity/suspicious transactions. 4. Airtel Payments Bank also reserves the right to discontinue this offer without assigning any reasons or without any prior intimation whatsoever. 5. In addition to the above, this offer is also subject to Airtel Payments Bank’s General Terms & Conditions available on http://www.airtel.in/personal/money/terms-of-use. 6. Airtel Payments Bank does not warrant or guarantee availability of inventory on IRCTC website and app. So friends, IRCTC is an official site in which you can also check your train ticket status. For checking your pnr status and railway ticket inquiry you can also visit IRCTC.com website or app. If you want an information about train ticket seats inquiry, seats reservation, ticket confirmation.